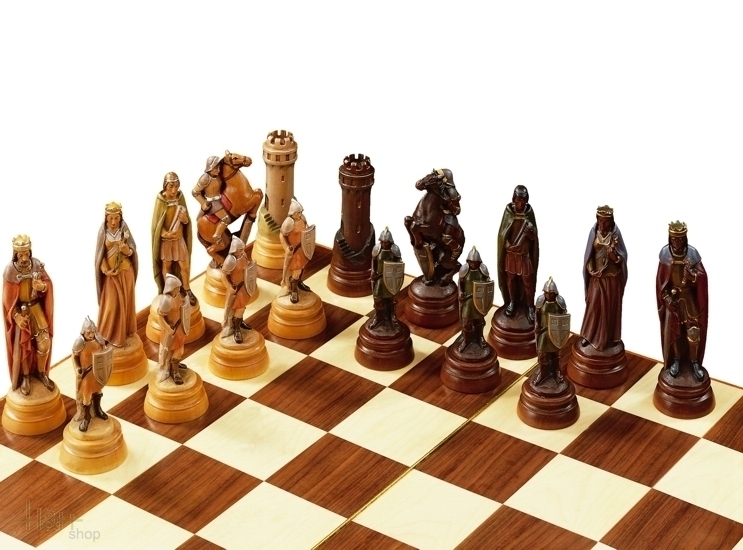 Chessboard in wood chess theme warrior. 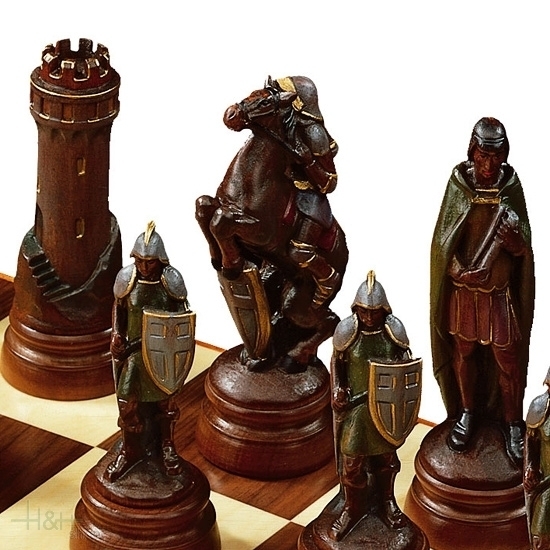 The peculiarity of these chess is that the more traditional elements to depict the furnishing style. The statues of the characters are standing and presented in full size. Every piece of the board is worked in detail. The Pedestrians are represented with crusaded shield, helmet, armor and are holding the sword in the lining. The position in which they are portraited is to guard. The king and queen are the most beautiful pieces. The sculpture of the king is wood worked in every detail: the coat has a beautiful decoration in the loop that links around the neck and the armor is complete with belt and typical knee stud. The king's figure portraited while grasping the sword and the scepter and, as usual, it has a very evident crown. 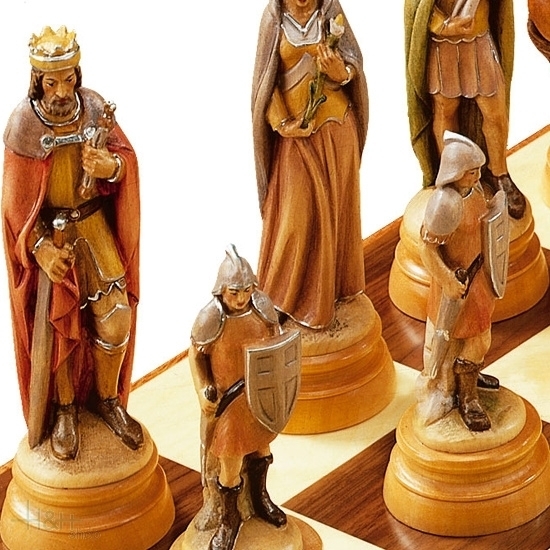 The defeat of the Queen is a unique piece for harmony and carving precision. A long cloak covering a typical costume of the medieval and the wood used for the skirt is worked to give the idea of lightness and movement. The setback of the queen is depicted with a flower and the crown. 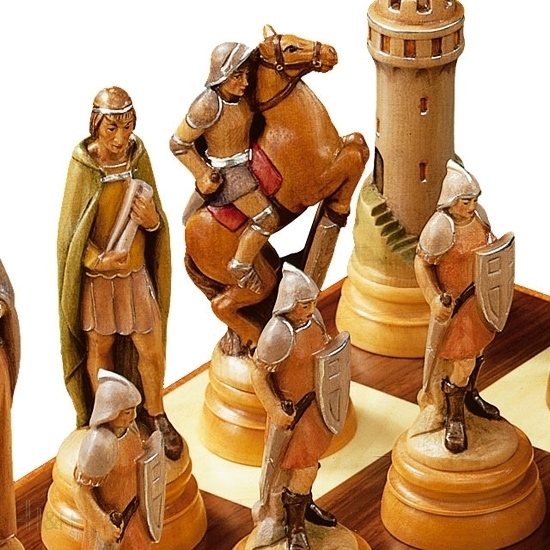 Very particular is the figure of bishop, represented as a messenger and not, as tradition of chess game, like a warrior.